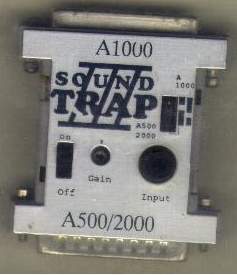 The Soundtrap III is a mono sound sampler which plugs into the parallel port. Unlike most samples it supports the A1000, you simply plug in the sampler the other way round and flick a switch. The unit can be switched on/off, has a gain potentiometer and has a single RCA input.